Ever wonder why your electric bills are so high? Well, now you have a cost-effective way to find out which appliances are being energy hogs, and which aren't. It's called the Kill A Watt° Energy Monitor. 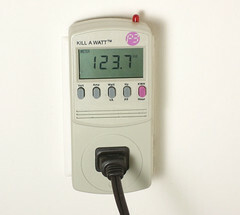 Plug in the Kill A Watt into an electric socket, and then plug in the appliance, and the device will give you an instant readout of the voltage drain. You can buy a Kill A Watt, but now, you can also borrow them from your WCCLS library, thanks to the Energy Trust of Oregon. You can borrow it, like a book. Reserve yours today through the WCCLS catalog. The Kill A Watt can reveal many surprising energy wasters—like a television that is turned off but still draws power. Or older appliances that may cost a bundle to keep around. It's simple to use. The monitor shows how much energy the device is using in kilowatt hours, the same measurement used on electricity bills. Those numbers can be calculated to show energy costs by hour, day, month or year. Monitors at the library are packaged with directions and tips, plus advice on how to apply the information learned to start saving energy. Using the results from the Kill A Watt®, households can make adjustments that can reduce their overall energy use and lower monthly utility bills. Check out - literally - our new Kill A Watts. It's good for your bottom line. Over half of Washington County Cooperative Library Services (WCCLS) Summer Reading's youth and teen participants met their reading goals! That's over 13 thousand kids! Almost 28 thousand children, teens and adults participated this summer. WCCLS Summer Reading programs continue to grow in popularity. Washington County libraries allow children and teens to set their own reading goals for the summer — with prizes as an incentive to achieve these goals. Prizes include such things as free tickets to a Portland Trail Blazers game or discounted admission to Oaks Amusement Park. This year 52% of all participants reached their reading goals (13,471 kids). By contrast, just over 17,000 kids participated in the reading program during the summer of 2005 and with 9,013 meeting their reading goals. While the County has grown, these statistics demonstrate that Washington County is a county of readers – at all ages and stages. Reading to learn is a keystone of the American education system. A child’s ability to maintain their reading skills during the summer break is vital to their ability to kick off the new school year fully prepared. This year 11 of the 15 WCCLS member libraries offered an adult summer reading program. For many parents this provided an excellent opportunity to model for their children the value of reading not only for its educational value, but for the pure enjoyment. Just over 2,000 adults participated in the 2010 program. While all fifteen of our member libraries continued to provide youth and teen summer reading programs – reaching 25,784 participants. At this time WCCLS is asking parents to provide feedback to assist with planning and improving future summer reading programs for youth, teens and adults. Please visit www.wccls.org/survey to share your thoughts. The deadline to register to vote for the November General Election is October 12th. The next election is November 2, 2010. The voter registration deadline is no later than the 21st day before the election at which you intend to vote. A day-of postmark will count, but the Washington County Elections Division strongly advises you to mail or drop off the registration before the 21st day before (as sometimes, the postmark can be hard to read). May I register to vote in Oregon? You are a citizen of the United States of America. Note: If you are 17 years of age, you will not receive a ballot until an election occurs on or after your 18th birthday. Most libraries and public offices have voter registration forms in both English and Spanish. You can also register to vote online in English or register to vote online in Spanish. Or, you can find the forms in PDF format online in English and Spanish. Fill out the Voter Registration Form. If you use a printed form, complete it using a black ink pen. If you use the online PDF, you can fill out the form, using the free Adobe Acrobat Reader software, by tabbing through the fields and typing in the information. Then print it out. Turn or mail it in by the 21st day before the election you intend to vote in. Your county elections office will mail you a card saying that your voter registration was received. If you have any questions, be sure to call your county elections office. Divorce is tough for everyone involved, including kids. Children can find divorce to be confusing, sad, and stressful. Hillsboro Public Library now has Divorce Kits that you can borrow within the WCCLS system. Each kit contains five children's books and two books for parents, to help families understand and cope with divorce. The children's books are aimed at younger elementary school kids and preschoolers. Difficult questions kids ask--and are afraid to ask--about divorce by Meg F. Schneider and Joan Zuckerberg. You can place a hold on the kit from any WCCLS library. Beaverton City Library is celebrating 10 years in 10 days! Friday, September 10, 2010 is the 10th anniversary of the opening of the Beaverton City Library at 5th and Hall Streets. Join them September 10–19 for a variety of events to celebrate! Events include birthday party with cake, a Michael Allen Harrison concert, a drumming circle, Beaverton Civic Theatre improv, an evening at the movies, and the Beaverton Celebration Parade. But there's also a visit with Poet Laureate Paulann Peterson, a townhall with Honest Abe, a talk with KGW sports commentator Joe Becker, and a reading from the author of Gimme Refuge, Matt Love. There's also children's events involving small mammals and reptiles, face painting, chalking sidewalks, etching bookmarks, a mommy & me matinee, and a symphony storytime. Teens can attend a read-in, or their own movie matinee. You can also learn how to help bees and other pollinating insects, about filmmaking & visual effects creation, and Beaverton Community Vision goals. For a complete list of events see www.beavertonlibrary.org/birthday. Beaverton City Library is located at 12375 SW Fifth St.